Deneen Pottery Mugs Featured in Central Florida Bed & Breakfast! Thurston House in Maitland has just received a shipment of new mugs and vases for 2010. They were made by the premier producers of custom handmade logo stoneware, Deneen Pottery. They are a family business that was started in 1972 by Peter and Mary Deneen. Cloth & Clay, Inc. was their name from 1992-2001. Today, they are well known as Deneen Pottery: Same people, same excellent products. All products are hand-thrown stoneware designs that meet their customers specifications. Each piece is carefully crafted, one at a time. 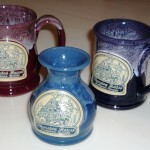 Every year they come out with new mugs shapes, sizes, other products, new colors and fabulous glaze finishes. 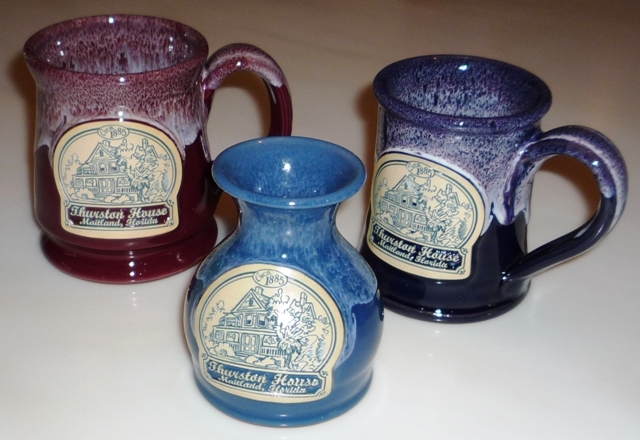 The new Thurston House mugs can be found in colors such as deep rose, teal, wisteria and plum, to name a few. The bud vases are featured in federal blue with a rose white glaze – just beautiful! 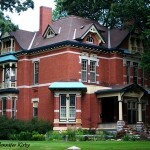 These items are used at Thurston House but are also offered for sale. Get them while they last! Some people travel across the country and specifically stay at inns that feature these beautiful mugs so they can bring one or two home for their ever growing collection. Come see! Ironically, Deneen Pottery is located in St. Paul Minnesota. This is where “my Mr. Thurston” was from! 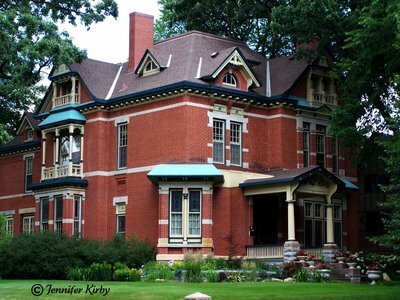 This is the Thurston House on Summit Avenue in St. Paul.